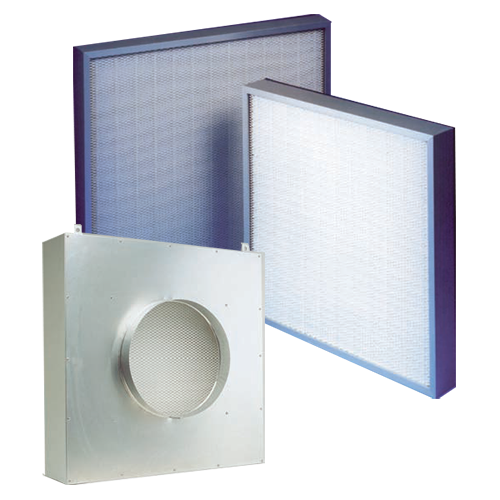 High efficiency air filters for use in clean room and all other HEPA filter applications including laminar flow benches, and can be fitted into ceilings and walls. Specifically designed to remove the finest particles in order to meet the most stringent performance criteria. Our Terminal Hoods are designed to meet the needs of high technology process industries for HEPA and ULPA grade filtration. The range offers efficiencies of up to 99.9999% at 0.12?m when tested to BS EN 1822. These modules are designed for clean room applications in hospitals, laboratories, food, pharmaceutical, and electronic component plants. Mini-Pleat filters consist of finely pleated water resistant micro-fibre glass paper media, positively spaced using continuous thermoplastic cord. Positive pleat separation maximises the use of the media area and minimises pressure drops. The Mini-Pleat pack is bonded into the filter frame using Polyurethane. For handling and transit protective grilles are fitted on the inlet and outlet faces as standard. Terminal Hoods are factory sealed and made with Polystyrene or Aluminium plenums. These mini-pleat filters are available as standard 69mm, 90mm, 115mm and 124mm deep, other depths are also available, ask for details. Terminal Hoods are also available in a range of depths, and spigot sizes, please contact us for full details.